Evergreen Pyrethrum Concentrate was previously labeled under the name PyGanic Pro. Evergreen Pyrethrum Concentrate is a broad spectrum insecticide that is OMRI Listed for use in both certified organic production and situations where a botanical insecticide fits the needs of the customer. Delivers fast, effective control of insects including Ants, Cockroaches, and Stored Product Pests with a quick knockdown. Contains pyrethrum - a botanical insecticide derived from a chrysanthemum flower. Food and Non-Food Areas of Food Handling & Processing facilities. For use in Certified organic barns, dairies, and poultry houses. Shelf life is 1 year in original commerical packaging stored at room temp. Apply 4.5 to 18 fluid ounces per acre (333 ml to 1,331 ml/Ha) by ground equipment in sufficient water for thorough coverage. This product may be applied by air at the rate of 4.5 to 18 fluid ounces per acre (333 ml to 1,331 ml/Ha) in a minimum of 20 gallons (75.6L) of water. Mix only enough for immediate use. Spraying should begin when insects first appear. Do not wait until plants are heavily infested. Do not apply more than 1 time per day. Combine 16 to 32 fluid ounces with 100 gallons (1.25 ml to 2.50 ml/L) of water for applications with conventional sprayers, or 7 to 15 ml (1/4 – 1/2 of a fluid ounce) per gallon (2 ml to 4 ml/L) of water for applications with handheld or backpack sprayers. Combine 16 to 32 fluid ounces of Evergreen Pyrethrum Concentrate with 100 gallons of water for applications with conventional sprayers or 16 to 32 fluid ounces of Evergreen Pyrethrum Concentrate with 10 gallons of water for applications with low volume mist blowers or 1/4 - 1/2 of a fluid ounce per gallon water for applications with handheld or backpack sprayers. To kill insects on Turf, Ornamental Plants, Gardens, Landscaping, Foundation Walls and Perimeters mix 1/4 to 1/2 of a fluid ounce of Evergreen Pyrethrum Concentrate per gallon of water for applications with compressed air sprayers or pump driven sprayers. For commercial production of listed crops to kill listed insects dilute ¼ to ½ fluid ounces of EVERGREEN Pyrethrum Concentrate per gallon of water (2 ml/ L of water to 4 ml/L of water). Apply diluted solution with all types of agricultural sprayers, including compressed air sprayers or pump driven sprayers. Combine 16 to 32 fluid ounces of Evergreen Pyrethrum Concentrate with 100 gallons of water for applications with conventional sprayers or 1/4 to 1/2 of a fluid ounce of Evergreen Pyrethrum Concentrate per gallon of water for applications with handheld or backpack sprayers. We mostly use this product in our mostly organic garden. It works great. Mixture ratio is dependent on pest. 1 Tbs. 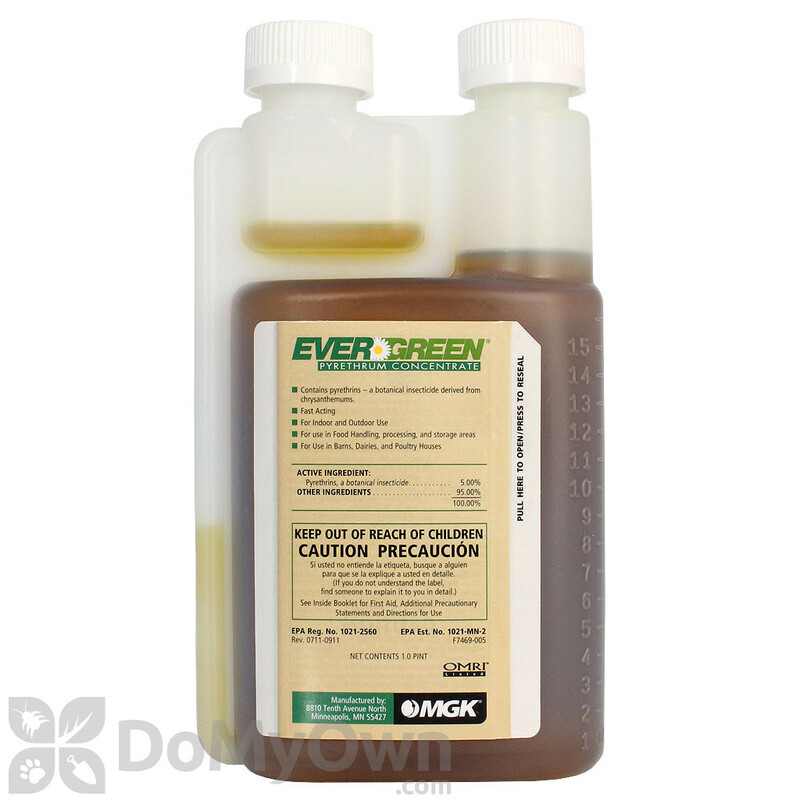 per gallon works good for aphids, whiteflies, thrips, sap beetles, bean beetle larva. It's expensive but what organic isn't. We've had a terrible problem with fleas this year & regular pyrethrin based flea soap wasn't solving the problem so I started mixing a very small amount to some flea shampoo & it works great for that too. I can only guess that since pyrethrins are degraded in an alkaline solution (such as soap), that the flea shampoo is not strong enough. Adding a small amount of this product ( 1 ML or 1/5 of a teaspoon ) to a few tablespoons of soap just before bathing brings the potency to a sufficient level. I'm very pleased with this product. I have been battling root aphids in my indoor garden for several weeks. The other products I have been using were having a very limited effect, so I finally tried a root drench at about 10 ml per gallon, and noticed an immediate and drastic reduction in the population of aphids. If you are looking for a good (organic) knock-down agent to control bugs in your garden, I highly recommend this product. Made by the same company that makes Pyganic this product is identical to Pyganic pro at 5 % pyrethrum and is labeled OMRI.With a 2 year shelf life the pint size is ideal.Quart size of pyganic 5 % cost 150 0r more elsewhere. Fast shipping and free freight. Just wish this company carried a full line of organic farming pesticides. very satisfied. 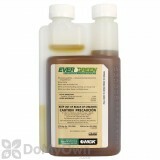 Works fantastic on spider mites!!!!! This product did not work at all. I read the reviews and got hooked, but was let down. Is Evergreen Pyrethrum Concentrate the stuff used by Billy the Exterminator to get rid of yellow jackets? We honestly do not know what brands of insecticide Billy the Exterminator uses. 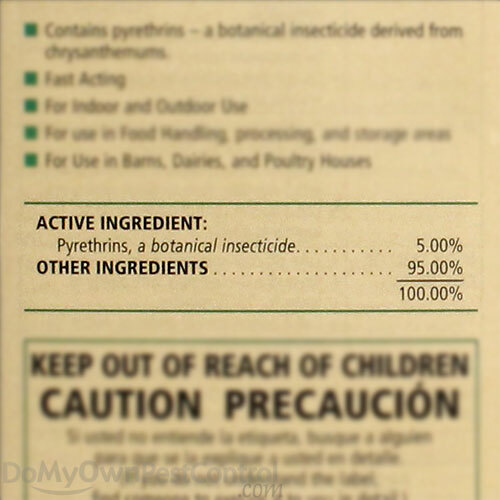 We do know that he uses pyrethrin based insecticides because they are more environmentally friendly. Evergreen Pyrethrum Concentrate is a pyrethrin based insecticide but it is not labeled for use on wasps. We recommend using something like Wasp Freeze. Wasp-freeze is specially formulated to provide instant knockdown of yellow jackets, wasps and hornets. Knockdown is quick so no stinging pheromone is released, thus reducing the possibility of stings. The Wasp Freeze can has a jet nozzle that will spray up to 15 ft away. Evergreen Pyrethrum Concentrate vs. ExciteR? Any reason to use ExciteR over the Evergreen Pyrethrum Concentrate? Would like to keep it Organic. The Evergreen Pyrethrum insecticide contains only all natural products and is OMRI compliant. The Exciter contains a synthetic synergizing agent called Piperonyl Butoxide also known as PBO along with the natural pyrethrin insecticide and is not OMRI compliant. 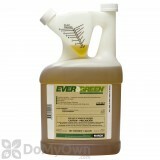 Evergreen Insecticide is the way to go if you need a product that will fit into an organic pest control program. Customers will need to make their own decision as to what they consider safe. Some of these products are natural and organic and others aren’t. Some products, like the miticides, probably shouldn't be used when the plants are flowering. The Roach Control Kit #2 is perfect for roach control problems in homes and apartments. This professional kit includes 1 packet of Demon WP Insecticide (which makes 4 gallons of finished solution) for spraying the outside perimeter of the home and inside underneath appliances, behind cabinets, under toilets and sinks, etc. You'll also get 4 x 30 gram tubes of Advion Roach Bait Gel--one of the best roach baits on the market. Advion can be applied up high in the kitchen in the corner of cabinets and in cracks and crevices in kitchens and bathrooms. The bait contains a slow-acting poison that attracts and kills feeding roaches, who also spread the bait to other roaches by contact or by sharing food. Finally, 20 Gentrol Point Source stations provide an IGR (Insect Growth Regulator) that will stop roaches from laying eggs, helping to halt the infestation. The combination of an IGR with roach bait is a highly effective roach control strategy that is widely used by pest control professionals. Demon WP must be applied with a 1 gallon pump sprayer. Please also take a few minutes to read our article How to get rid of roaches as it contains many great tips that should help you get rid of the infestation. Will Evegreen Pyrethrum Concentrate kill deer ticks? We're seeing them on our dog and on us even just for a walk in our backyard. Yes, Evergreen Pyrethrum Concentrate will kill Ticks. However, Evergreen Pyrethrum Concentrate does not provide long term protection, it is a contact kill only. This means that Evergreen Pyrethrum Concentrate must be sprayed on the tick directly in order for it to kill the tick. We would recommend our Tick Control Kit for better results. This kit contains 1 quart (32 oz.) bottle of Permethrin SFR 36.8% and 1 pint (16 oz.) bottle of Archer IGR. The Permethrin SFR provides knockdown and residual control of adult tick populations while the Archer IGR disrupts the life cycle of ticks by preventing immature stages from developing into adults.